Moorea  is an island in the Society Islands archipelago, only a few kilometers off the northwest coast of Tahiti. Moorea doesn't really have any "cities" although there are several towns and villages. When entering a village you will see an official road sign stating the name of the village you are entering. When exiting the village, you will see the same sign with village name, but the village name will have an "X" over it. 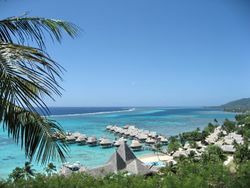 If you are visiting French Polynesia on a budget, Moorea is the place to be. Moorea is like Tahiti but cheaper and less touristy. It's mostly rural and farming is big. There are chickens everywhere; the roosters crowing at 6 am can get old after a few days. Mosquitoes can be a problem away from the coast, so bear that in mind when selecting a place to stay. Everybody speaks Tahitian and French. Anybody working in tourist services will speak enough English to get by, although it's not well spoken by the general public. Take the high-speed Aremiti ferry from Papeete. It's only 1500 xpf (as of August 2016), a couple of bucks more than the slow one, takes half the time, and it's much more sea-worthy. The channel between the islands can be choppy. Check the Aremiti ferry schedule or Air Tahiti flights on their websites as they vary daily and on the weekend. Don't rely on locals' knowledge - they may be going off old information. The roads are surprisingly good (thanks France). There is one main ring road all around the island that takes about one hour to drive in a complete circle (or two hours by bus). There are about three sections that are very bad with tons of potholes and marked "deformee" or your hotel concierge can circle them for you on a map. You can rent a moped for a day for about $50 USD and drive it around the island in a few hours without fear of death. If you don't know how to ride one, take it slow or you WILL get hurt. Or rent a car (expensive), or take a taxi (expensive). Car rentals may be available hourly from your resort or hotel. Hitching works with the usual caveats and risks. Le Truck service around the island has been discontinued. There is limited bus service around the island - two buses meet the arriving Aremiti ferry and then go to Le Petit Village in the north west corner of the island, one via the south coast and the other one via the north coast, both routes are about 30km and take about 50 minutes. Same buses will depart from Le Petit Village (near Total gas station) roughly two hours before the scheduled ferry departure time. Keep in mind that ferry times vary almost daily so best way to guesstimate the bus arrival time is to look up ferry arrival time and add appropriate timeframe to it (ie if you are half way between ferry and Le Petit Village, add 25 minutes). For the other way, find out ferry departure time, subtract two hours (when buses will leave Le Petit Village) and add appropriate extra time from Le Petit Village to your location. If taking the bus form Le Petit Village, show up a bit earlier than two hours prior to the ferry - the buses sometimes leave up to 15-20 minutes prior to their quasi-scheduled departure time. As of August 2016, bus fare is set at 300 xpf no matter how far you are going. If catching the bus along the road, just wave it down - there are almost no designated bus stops around the island. Be aware that sometimes even the bus drivers are confused about the ferry timings for the day and may give out wrong advice - always base your decisions off arriving/departing Aremiti ferry schedule. Poisson cru is the way to go. Food trucks (roulottes) are also present though not like in Papeete. Dairy products - Milk is not pasteurized and thus cheeses and yogurts are more flavorful. Across the road from the ferry station is a pizza place well worth a visit. It's run by a French couple that speaks no English, but the menu has English explanations and the ham and pineapple are highly recommended. There are also great pizza places just up the road from Club Bali and the Moorea Pearl Resort. Both are reasonably priced and you will get your money's worth. We hit either up when we have been in Moorea. Every hotel has a bar and there are lots of little bars and restaurants around. But drinking in bars in French Polynesia is damn expensive. Your best bet is to buy some Hinano bombers at the store and drink on the beach. You will be charged an additional 60XPF deposit fee when purchasing Hinano bottles larger than 12oz. You can redeem your deposit at any location that sells Hinano. The larger bottles are sent back to the Hinano brewery for reuse/refill. Tabu is another local beer, only available in 12oz bottles and slightly more expensive compared to a 12oz bottle of Hinano. Tabu is better tempered to the Tahitian heat. Unlike Hinano, Tabu is very drinkable at all temperatures: cold, slightly chilled, or room temperature. There are only a few really cheap places on Moorea and they are mostly near the northwest corner of the island. Some others aren't on the beach, but you might get carried away by the mosquitoes there. The north coast is the place to be. All the big resorts are in the north for a very good reason. The lagoon and beaches are much cleaner in the north. In the south the beaches are all brown water and pretty bad looking. Also in the north, almost anywhere you stay will have eating and drinking options within walking distance, that is not always the case in the south. There are some really fancy hotels and resorts here although no super-resorts like on Tahiti. Club-med used to have an outfit here but it's abandoned now. Moorea has almost no violent crime. Petty theft can be an issue. Check your valuables at the desk or keep them on you. At least keep them stashed out of sight. Odd things may be taken, like the beat up old sneakers you left outside to dry the night before you are leaving, forcing you to hitch a ride to the bus stop because you have no other footwear to make the mile walk up the road and the pavement is a million degrees and there's broken glass in the margin, and then buy $20 USD flip flops to wear on the plane. Perhaps due to its lack of reliable public transportation and its outrageously expensive taxi fares, Moorea has a serious drunk-driving problem (with both tourists and locals equally guilty). Take particular care when walking or cycling the island's only paved road after dark; it gets pitch-black and can be quite dangerous away from the main villages (where you'll also be more tempted to walk or cycle in the middle of the road due to the amount of broken glass on the shoulders). There are a couple of islets around Moorea you can visit. This page was last edited on 30 September 2018, at 01:25.